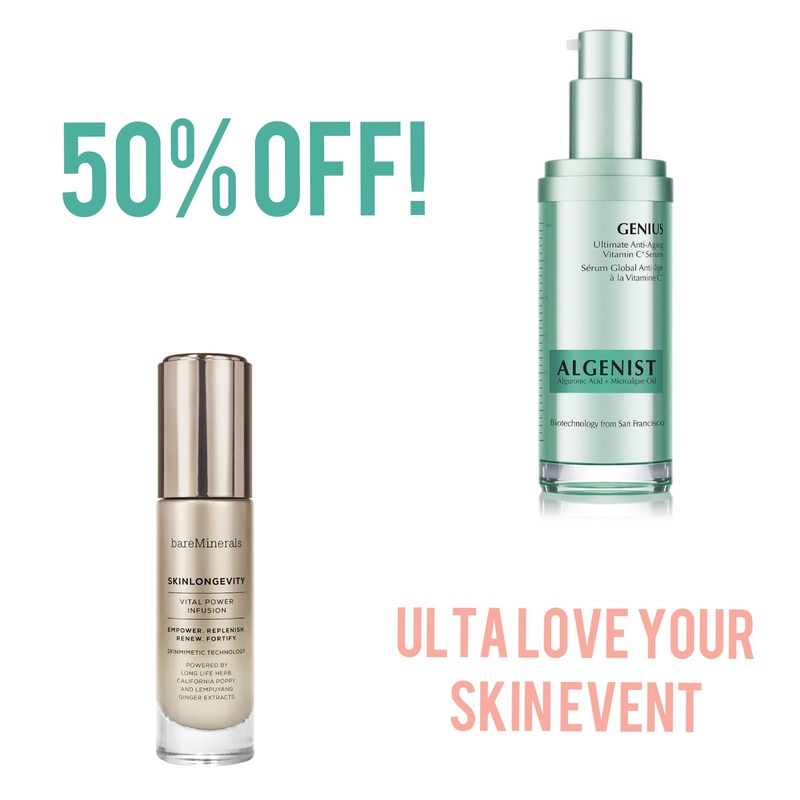 The Ulta Love Your Skin Event has been in full swing during the month of January, with 50% off deals happening every day. Today's deal really jumped out at me because it's two serums that I've used in the past and would definitely recommend! The Algenist Genius Ultimate Anti-Aging Vitamin C Serum, $59 (Reg. $118) is one of my favorite vitamin C serums and when I was using it I felt like my skin looked brighter and less lined. I finished out the entire bottle and would definitely repurchase! It didn't irritate my skin or cause redness like some other Vitamin C serums I've tried either because they use a derivative of C (3-O-Ethyl ascorbic acid). It's more stable and longer-lasting, so you don't have to worry that the potency will decrease halfway through the bottle. bareMinerals SKINLONGEVITY Vital Power Infusion, $19 (Reg. $38) claims to reduce fine lines and wrinkles, and help your skin look vibrant and healthy. I'm not sure about the fine lines and wrinkles part, as I didn't see too much of a difference there (maybe I didn't use it long enough) but I loved using this serum when I wanted my skin to look healthy and glowy. It really gave me a noticeable boost, which is great in the winter when my skin looks dull. Have you tried either one of these serums? Do you plan to buy either one today?